The old saying of ‘Eating for two’ is unfortunately just a myth!! Throughout different stages of your pregnancy you may experience different issues which may affect your eating habits such as morning sickness, cravings, tiredness, growth spurts etc. so being able to eat well all the time is often unrealistic, but eating nutritious, balanced meals when you can is a great start. Although it is important not to get too caught up in frantically counting calories the recommended daily calorie intake for the first six months of pregnancy is 2,000 (the same as a non-pregnant female) and then 2,200 during your last trimester but remember these are general guidelines - listen to your body, it will let you know what it wants*!!! 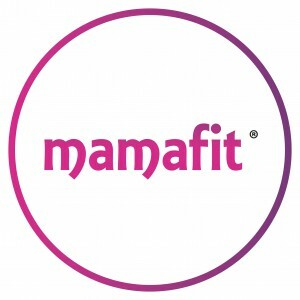 Do not try and actively lose weight during your pregnancy, however incorporating physical activity into your routine can help to manage non-pregnancy related weight gain. Eating a good breakfast is the best way to start the day as it sets you up with the energy you need for the day ahead; wholegrain cereals, porridge, eggs and smoothies are great ideas for breakfast. For lunch and dinner, try to cook food from scratch where possible avoiding processed foods or those high in saturated fat, salt and sugar. Most supermarkets now use a traffic light system on their packaging (see example below) which is a great guide to helping you pick healthy food. Aim to pick foods that predominately green. 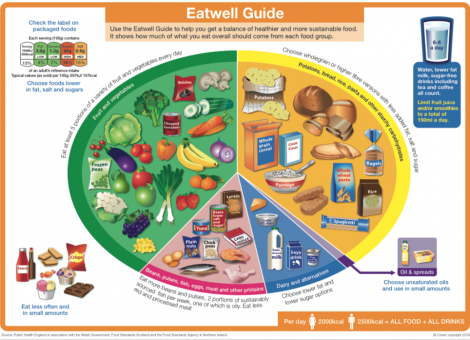 Another helpful tool is the ‘Eat Well Plate’ as it gives you an idea of portion size and what a ‘balanced’ diet look likes. Try to fill at least a third of your plate with fruit and vegetables. This is particularly important during pregnancy as they are filled with lots of essential vitamins and minerals. Aim to get your recommended ‘5 a day’ every day. 1) Make homemade soups, stews, chilli etc in bulk and freeze portions. These are great for when you are tired and really can’t be bothered cooking! - This is also helpful for when baby arrives! 2) Drink plenty of water to stay hydrated, helping you to avoid headaches and feel more alert. 3) Always carry healthy snacks with you so you are not relying on vending machines or other unhealthy snacks if you get hungry whist at work or out and about. 4) Get your family involved; plan meals together and share the cooking. It is important to establish healthy family eating habits early on, helping to set a good example for your child. 5) Use the internet for inspiration! There are so many healthy eating websites and apps that you can use for free that will give you great recipe ideas. 6) Plan your meals ahead and only go shopping for what you need. This will help you keep on track but also can be a great way of saving money! Ingredients: 1 mashed banana, 1 egg, 25g rolled oats, 1tsp cinnamon. Ingredients: one pack of chicken thighs or legs, one soup pack (onion, carrot, celery), 150g pearl barley, vegetable stock cube, mixed herbs. Fill a large pan with water, add chicken portions, bring to boil and simmer for approx. 15 mins. In another pan, add a small amount of olive oil or one-cal and add the vegetables. Cook for a few minutes until browned. Once the chicken has been cooking for 15 mins, remove the chicken from the water and leave to cool – Do not drain away the water! Add the pearl barley to the vegetables and then slowly add the water from the chicken to the vegetables until it covers all the ingredients. Add the stock cube and 1 tbsp. of mixed herbs. Bring to the boil and simmer for 30-40 mins. With 10 mins to go, shred the meat off the cooled chicken pieces and add to the soup. TIP: This can be frozen in batches. Ingredients: ¼ cauliflower, 2 baby corn, 2 spring onion, ½ red pepper, 6 baby tomatoes, 75g prawns, 1 egg, 15ml soy sauce, chilli flakes, 1 clove garlic (or 1tsp of lazy garlic), small bunch of coriander. Place the uncooked cauliflower and the coriander in a food processor or blender and blitz until it has a rice or couscous consistency. Dice all of the other vegetables. In a wok or frying pan heat a small amount of oil, add the garlic and chilli to taste. Add the veg and cook for 1-2 mins. Add the blitzed rice to the wok, add the soy sauce and cook for a further 2-3 mins until the cauliflower starts to soften. Crack the egg into the rice and stir well for a couple of minutes until the egg has cooked through and has covered the rice. Finally add the prawns and heat through until the prawns are fully cooked. *This can be replicated with any other fish or meat however you will need to cook the meat for longer so add before the vegetables. Pre-heat the oven to 180°. Combine all of the mixture into a bowl, place onto a baking tray lined with baking paper, cook for approx. 20 mins or until golden brown. Cut into squares. Please get in contact if you would like any further information on eating well or tips on how to have a healthy pregnancy!